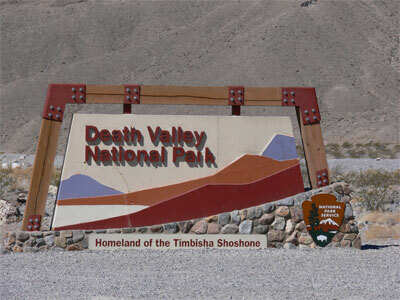 Entrance sign to Death Valley National Park, Homeland of the Timbisha Shoshone. Parking lot at Death Valley lookout where you were supposed to pay an entrance fee at an automated ticket dispenser. 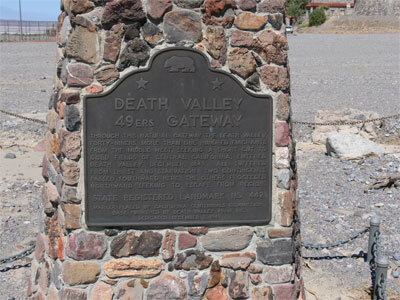 Plaque marking the natural gateway where the 49ers caravan passed on their way to the California gold rush. Of the 100 people, one died after becoming lost. 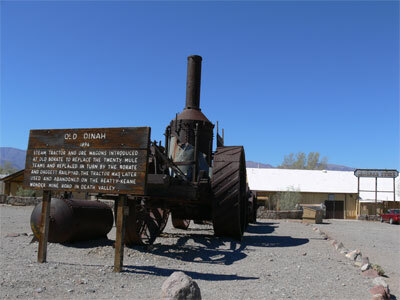 Old Dinah steam tractor and ore wagon that replaced the mule train in 1894, and was in turn replaced be a train. Death Valley Museum. The park staff here were very jovial and helpful. 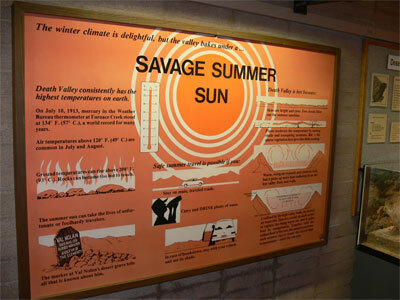 Waring sign about the Savage Summer Sun in Death Valley. 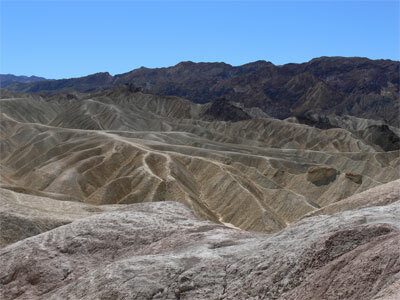 Death Valley consistently has the highest temperatures on earth. 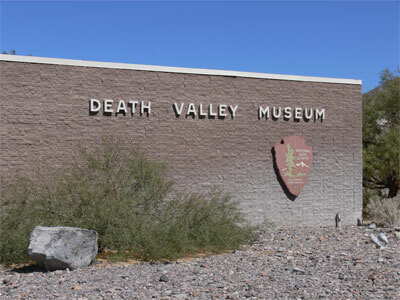 Death in Death Valley. 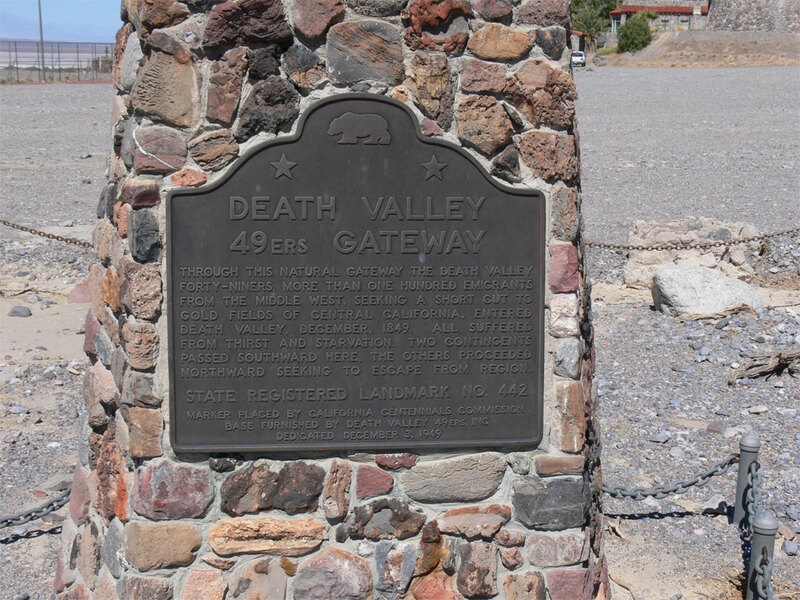 In reality, there was only one death in Death Valley, but nonetheless, it still has this feared reputation. 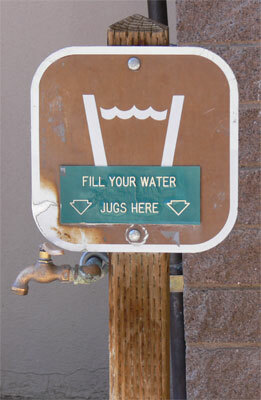 Sign outside of Death Valley Museum advising tourists to fill their water jugs here. I did and found I was drinking about every five minutes. 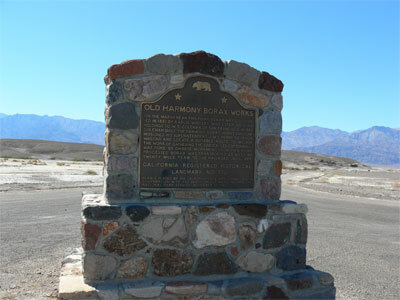 In 1881 Borax was discovered here. 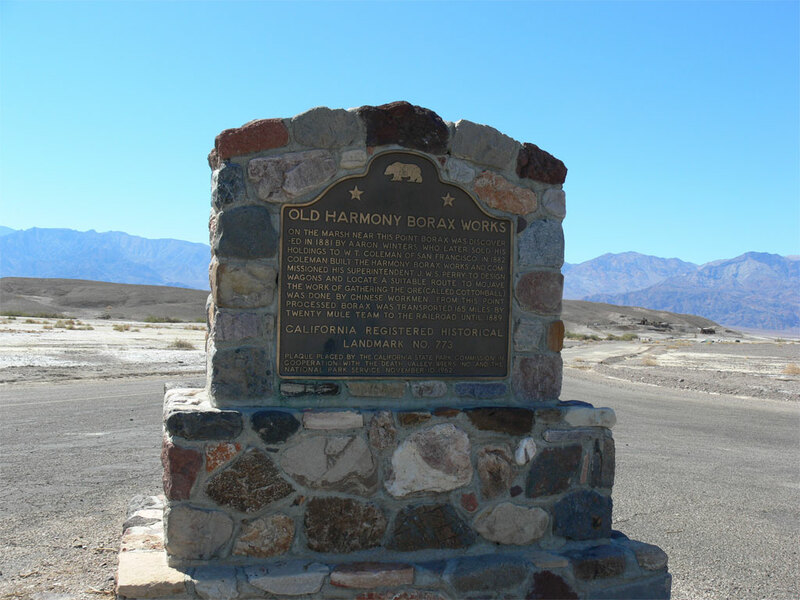 In 1882, the Old Harmony Borax Works was established to mine, refine and transport the Borax. 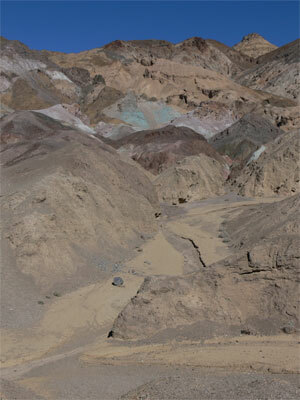 Though steeped in legend, the frenzied search for gold and other metals in Death Valley produced few fortunes. 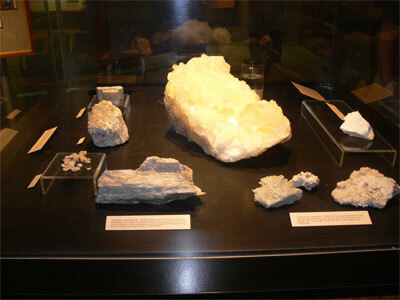 Borax, the "White Gold of the Desert," ranks as the valley's most profitable mineral. 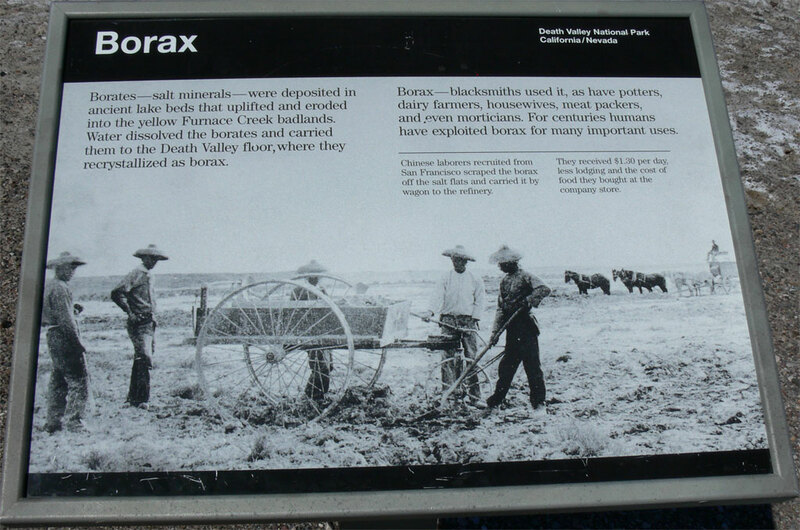 Area where Borax was raked up off of the desert floor. 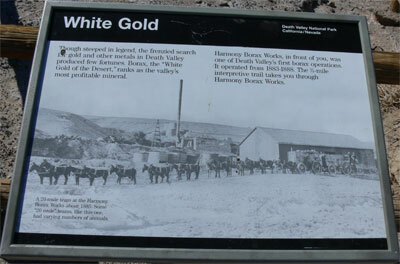 Chinese labourers recruited from San Fransisco, scraped the Borax off of the salt flats and carried it by wagon to the refinery. 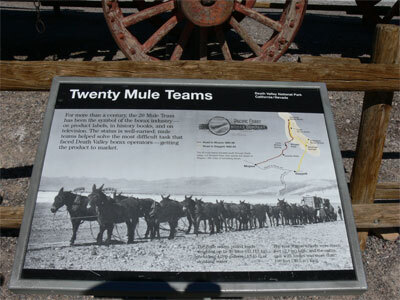 Twenty Mule teams pulled loads weighing up to 36 tons, including 1200 gallons of drinking water. The borax was refined on the site due to the cost of hauling it 165 miles out of the valley. The operation closed after only five years in 1888 due to discoveries of borax elsewhere in California. John at viewing area of Artist's Pallete on north side of Death Valley. 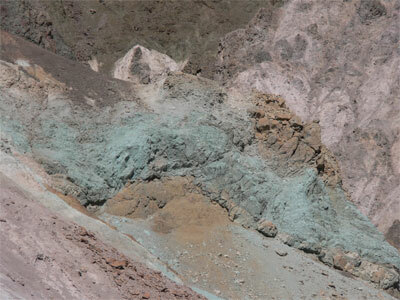 Green soil. 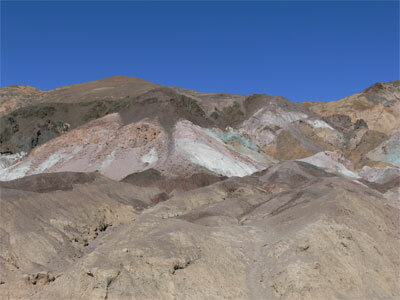 This area was at least as beutiful at the Painted Desert. 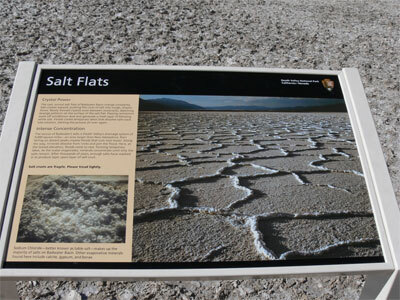 Salt Flats. 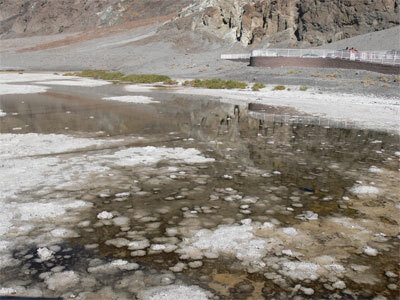 The source of Badwater's salts is Death Valley's drainage system of 9000 square miles. John at Badwater Basin, 282 feet below sea level. 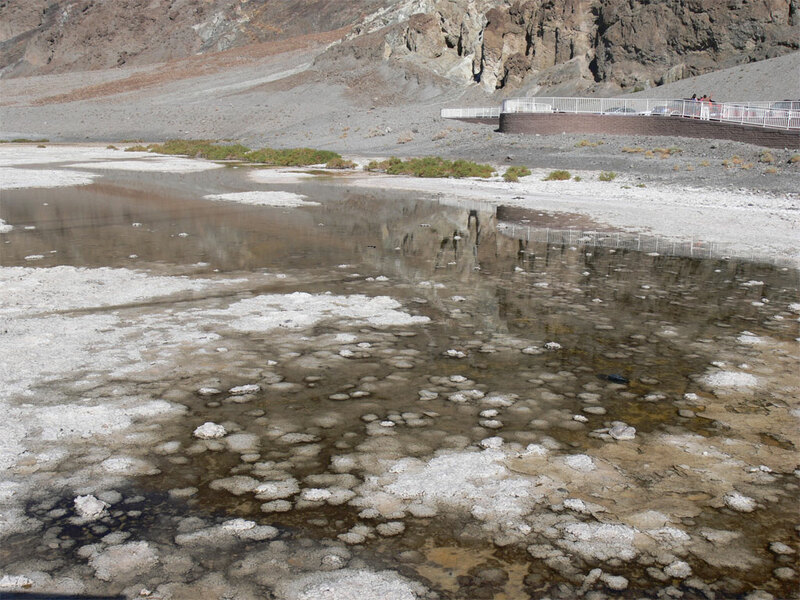 The spring at Badwater Basin. Anyone want a drink? 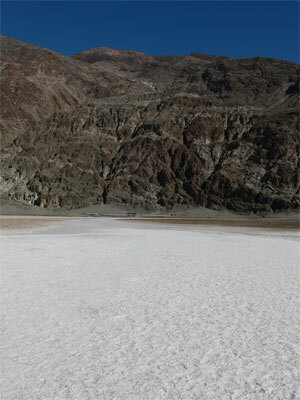 The valley floor was covered in crusted, dirty salt. 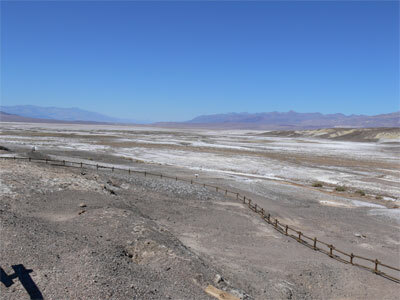 Walkway out onto the salt flat. 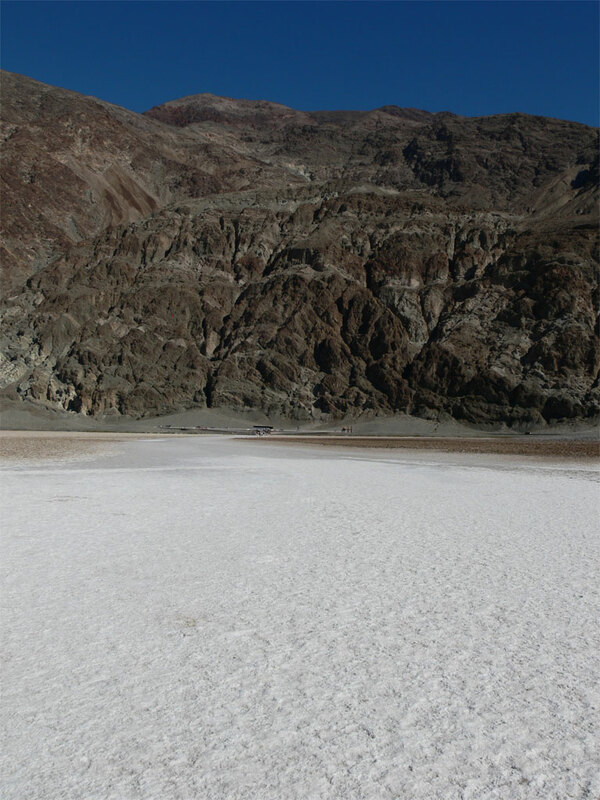 The white trail is where people have tamped down the salt, and the gray border is where no one has walked. 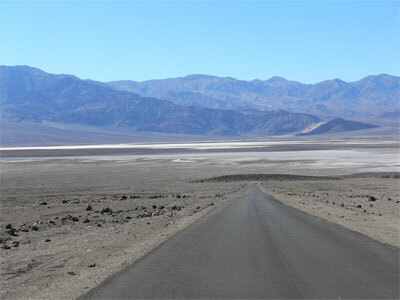 View back to road from the end of the walkway out on the salt flat. It was 34' C here. 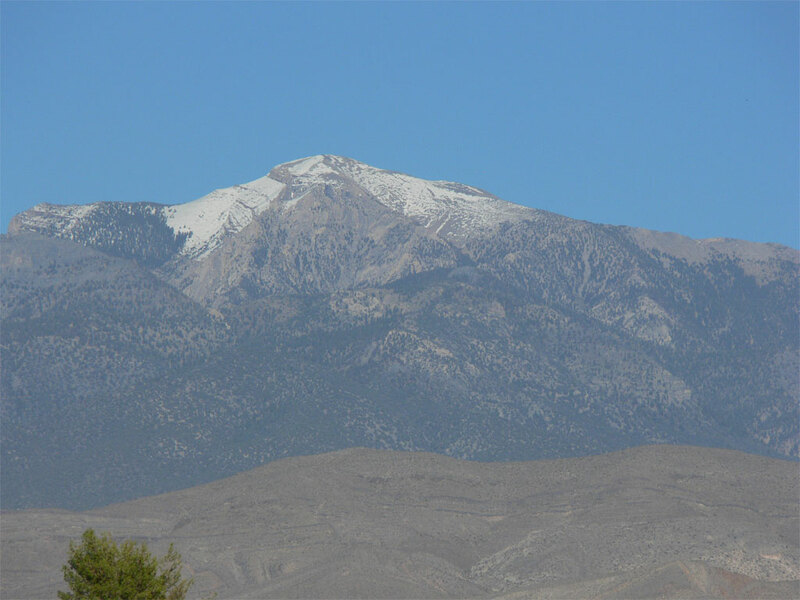 There was actually snow on the distant mountains surrounding Death Valley. 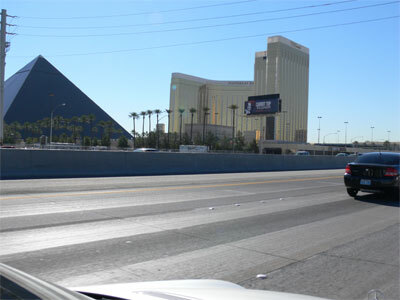 On the way out of our hotel in Vegas, we asked at the front desk where a good breakfast spot might be. Once again, the best place in town turned out to be the casino buffet. While not a bargain compared to some of the other places we’d stayed at, the food was excellent and we didn’t have to wait. As I walked back through the casino towards the front door, I noticed how many different types of gambling we’re going on. The even had off-track horse racing there. But, as Ronald noted, not too many people seem to be happy. I also noticed a lot of elderly people, and oriental people. I also noticed a continuous harmonious background sound that played everywhere in the casino. It seemed to be a rather hypnotic sound that must be conducive to gambling. As usual, Ronald drove in the morning and I played on my computer. It took us a couple hours to get to Death Valley, and again, I noted how dry everything was. 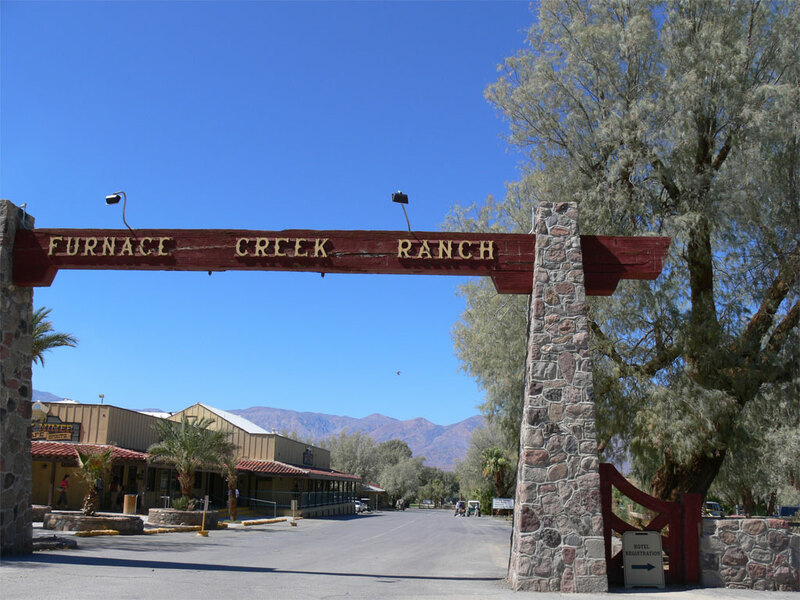 When we passed what was designated as Death Valley village, I only saw about a dozen buildings and the intersection. As we got closer to our destination of Furnace Creek, I noticed a highway coach parked off to the side and sensing a tourist attraction, we pulled in with it. We walked up an embankment and looked over a bare countryside. Below us we could see a salt valley, surrounded by barren hills. 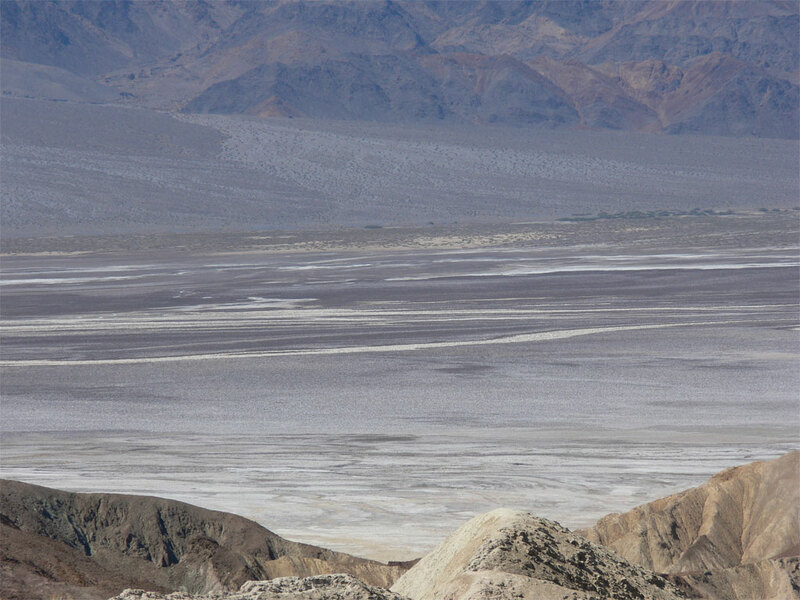 It looked like you were on the Moon, as there was almost no vegetation. 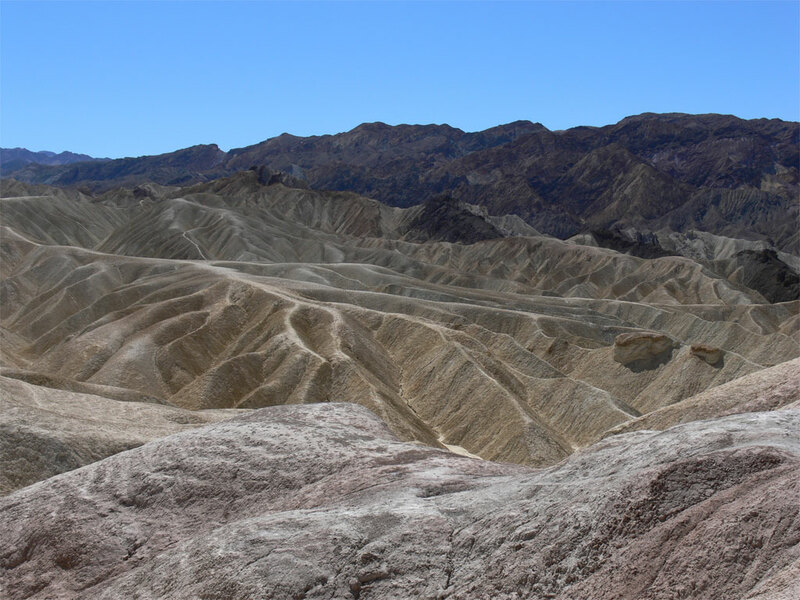 Erosion made interesting shapes in the hillside. 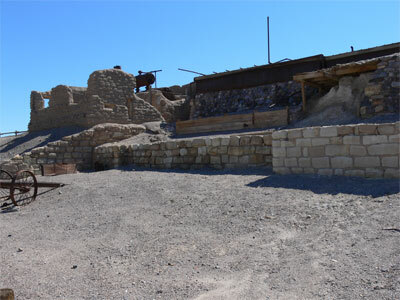 This location also had a chemical toilet, and a machine that would allow you to pay your fee for the park. It seems they were rather apathetic about collecting park fees around here, however we have the national park pass, and so we didn’t have to worry. About 20 minutes for there we pulled into what looked like a small oasis. We came over the crest of a hill, and there was a hotel with a red tile roof on the right. We pulled in thinking that this was our destination, but soon realized this was a private resort. 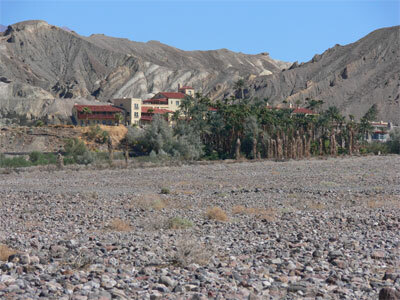 About a mile down the road we saw palm trees and vegetation in a valley surrounded by nothing but rocks. 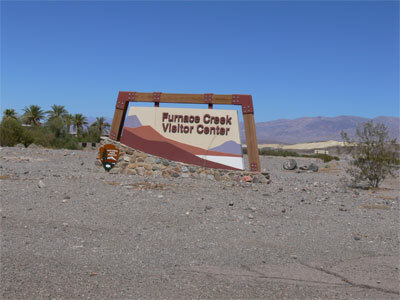 Sure enough, this was Furnace Creek. We pulled up to one hotel with an antique train parked out front. 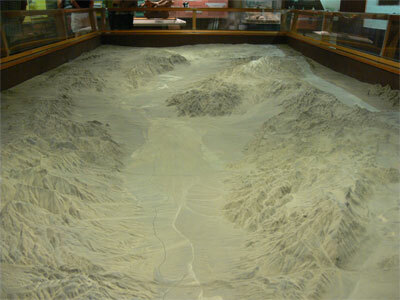 We then proceeded to the tourist information bureau, which was very well set up. 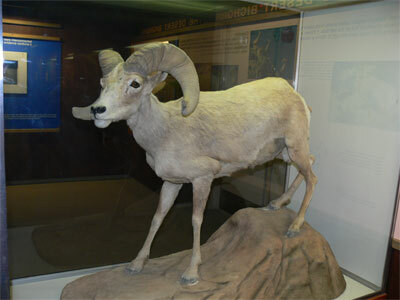 The park Rangers were most jovial, and I could see they were long-term employees. 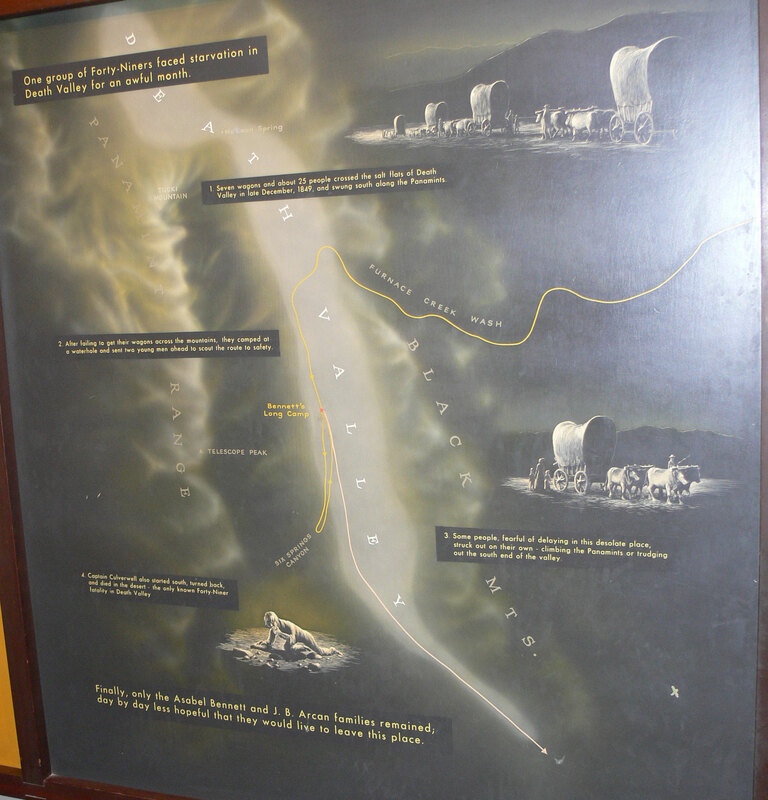 They gave us a map and highlighted the various points of interest. 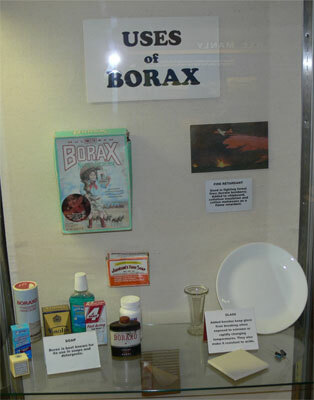 They was also a little museum there which showed the various uses of borax of which I had been completely ignorant. The ranger warned Ronald to be careful of me because she sensed that I had an inexhaustible curiosity. She sure pegged me right! There was also a small slide show in a theatre which we also took in. I started to recognize some of the photos of seen in years gone by in national geographic of desert life. It really can be beautiful. 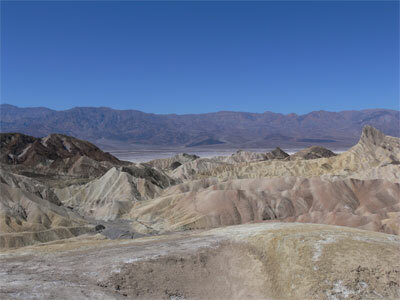 We also found out that the name, Death Valley, is somewhat of a misnomer. Apparently only one person died from the elements here. There was a wagon train that became lost here for three weeks. 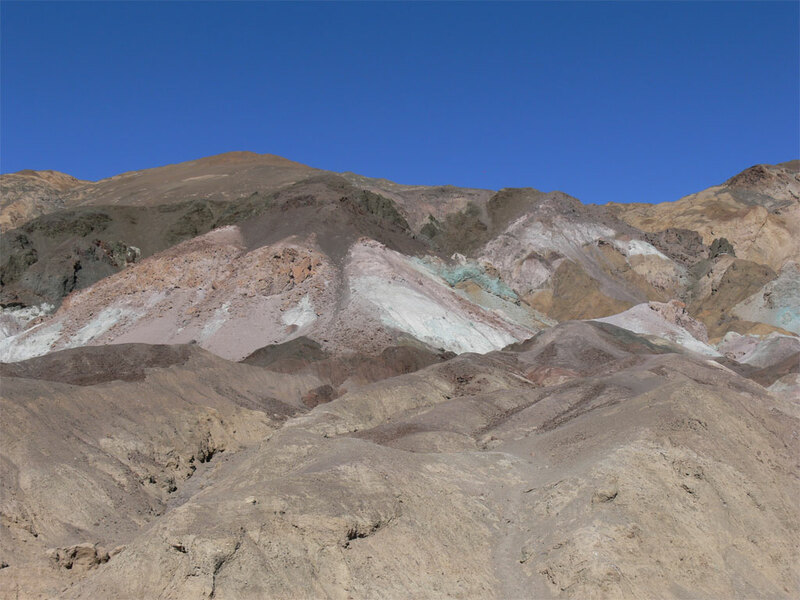 When they finally left, they were quoted as saying, “goodbye death valley.” Up until a few years ago, it did hold the record for the highest temperature of 157° F.
We headed about 1½ mile north to the borax mining site. 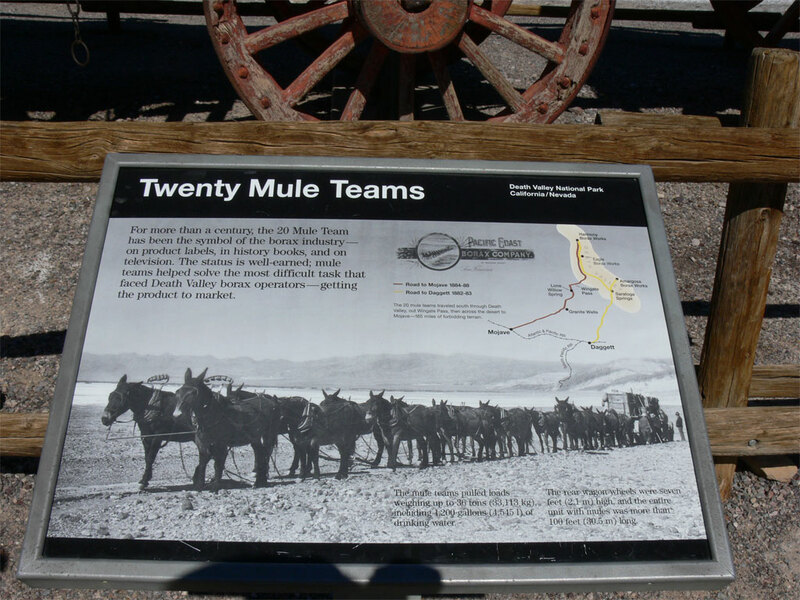 There was not much to see other than a rusty old boiler and a wagon train that used to be pulled by mules. The interesting thing about the wagon train was that the wheels were about 10 feet tall. We later found out that the crusty salts soil was always rough, and the bigger the wheels the smoother ride would be. 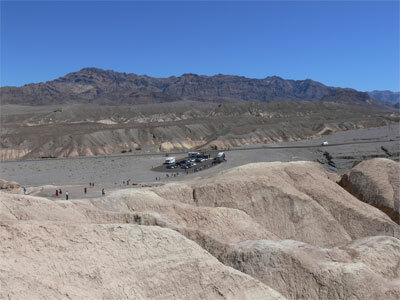 They also pulled the huge water tank behind them for the 160 mile journey out of the valley. They employed Chinese workers for $1.38 a day, minus lodging and food. 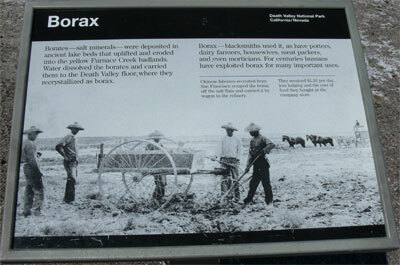 Their job was to rake up the borax crystals from the valley floor where they been deposited for eons. I also noticed a front in loader working along the roadway removing gravel that had washed onto the road. Apparently they’ve had some flash flooding a few days prior, and this always sweeps gravel onto the road. Around here, rainfall is a real event. 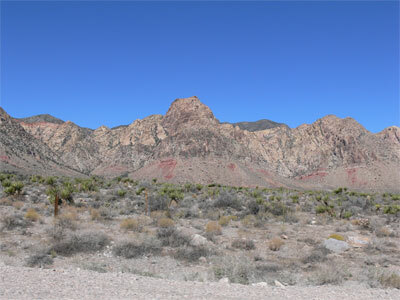 We turned around started heading south again, and turned off on a road called Artist Palette. This was about 3 mile long road up to the mountain range, which was indeed colourful. 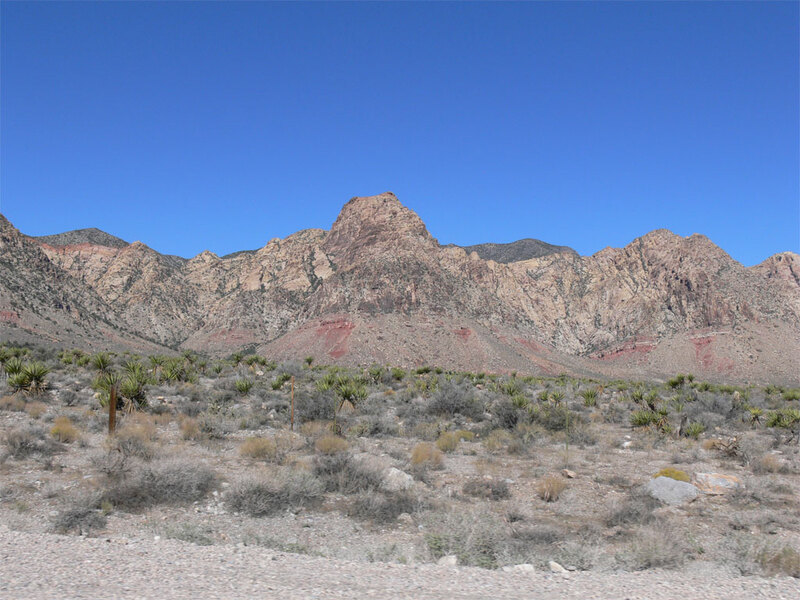 There were numerous vista points where we could take pictures of the green, red and every other color you could think of in the rocks of the surrounding mountains. At one point I asked a lady if she would take my picture. It turned out she is a professional photographer, and ended up taking a dozen pictures of me. 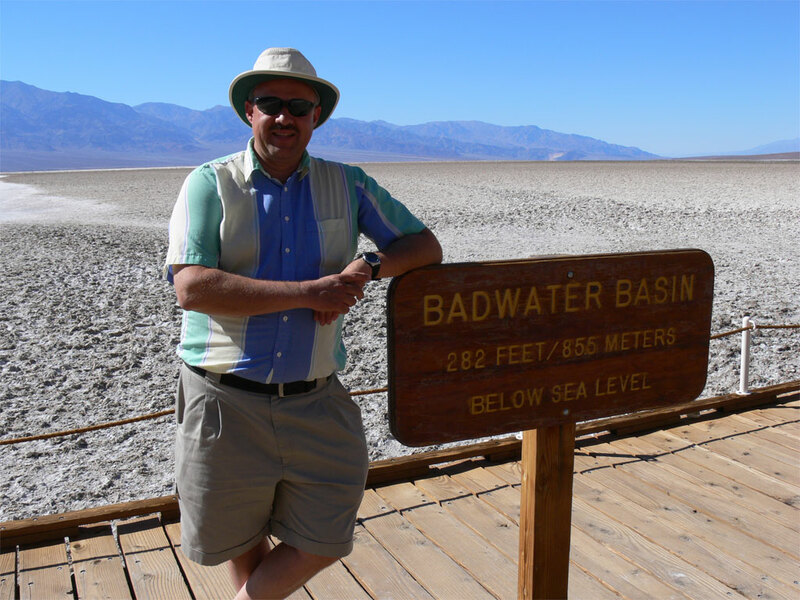 The next stop was Bad Water, which gets its name from the undrinkable water spring at that location. 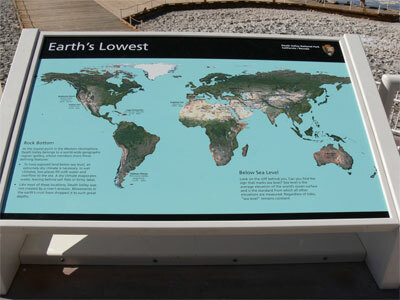 As you pull into the parking lot you can see a sign way up on the rock wall indicating Sea level. Apparently this is the lowest point in North America, at 282 feet below sea level. 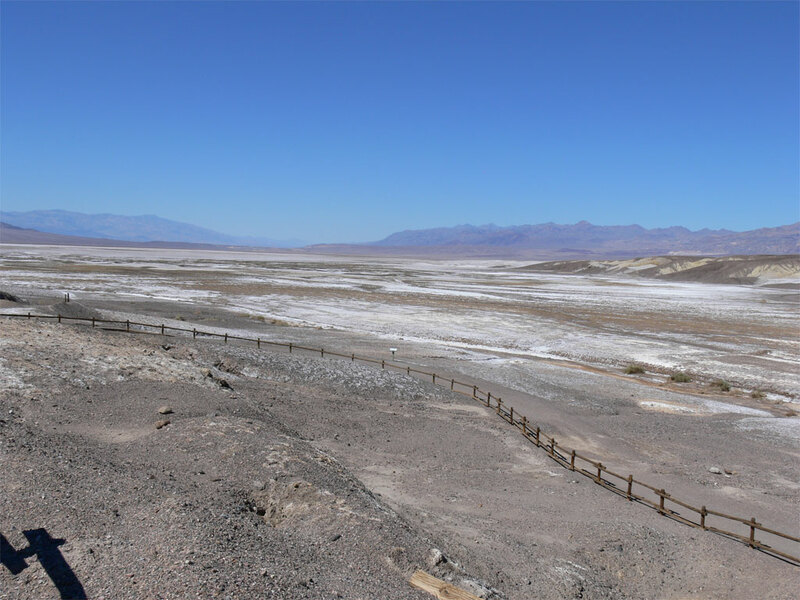 We walked out on a wooden walkway onto the salt flat. 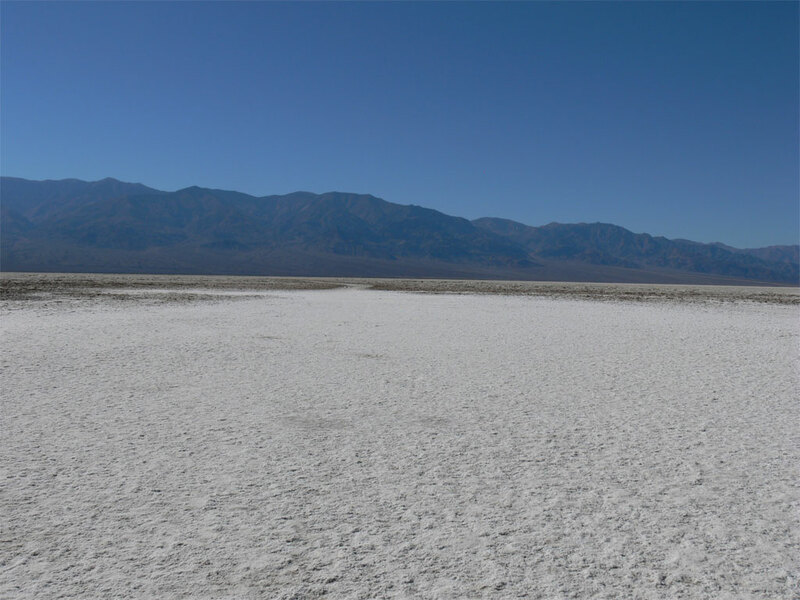 There was rough salt for as far as the eye could see across the valley floor. 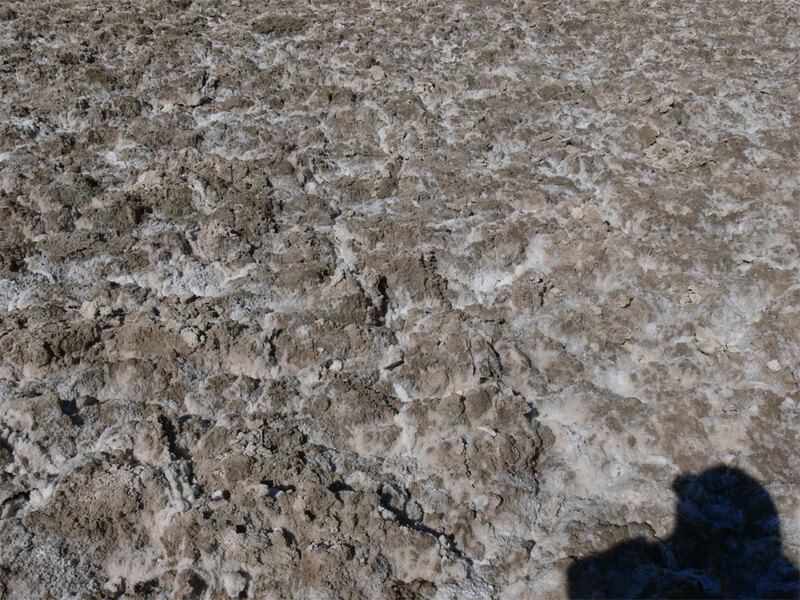 We walked for about 10 minutes where we had seen others tracks, but saw nothing other than just more salt. 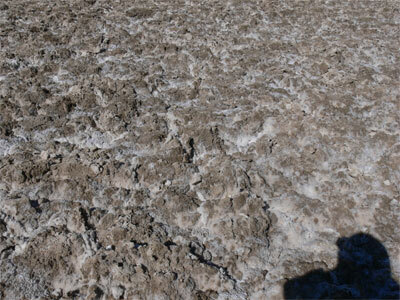 It was a dirty kind of salt on the surface, but where it had been trodden down, it looked a little cleaner. 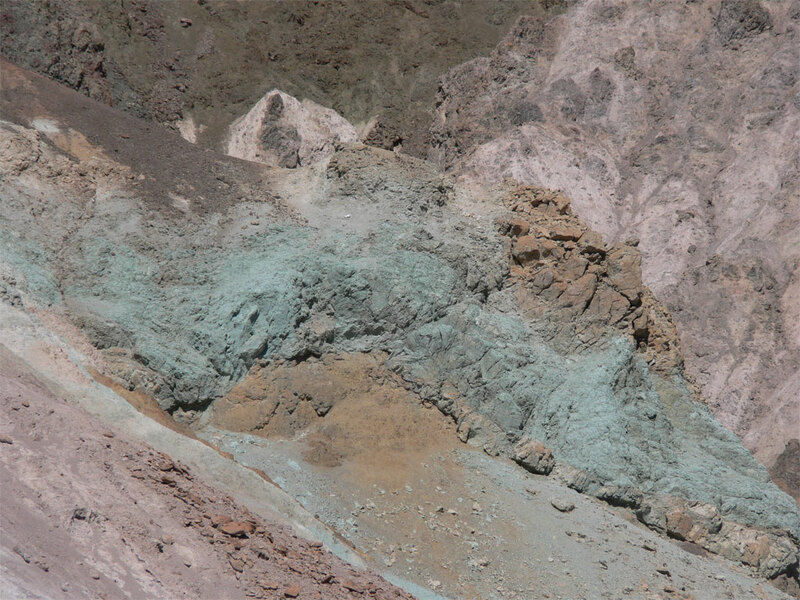 It kind of reminds me of what a snow pile looks in the springtime. The river leading into this valley has no outlet, much like the Dead Sea in Israel. 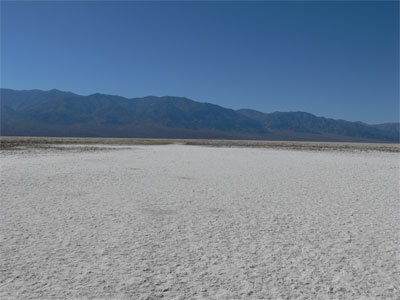 It was also very hot as we walk out onto the salt lake. The thermometer in Ronald’s car said it was 38°, and very dry. 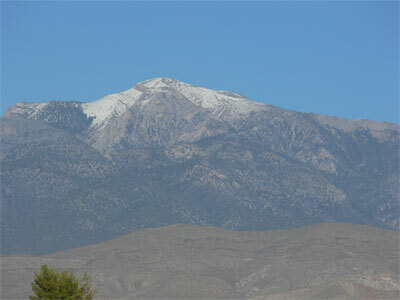 There was a slight breeze which made a little better, but I didn’t mind the heat. I did however make sure I had a water bottle in my hand all the time. I noticed as I was leaving that my sinuses seem to have cleared up. I think this type of dry area is actually good for me. Ronald, however, said that he couldn’t take too much of that type of heat. It was sure good that his car has excellent air conditioning. 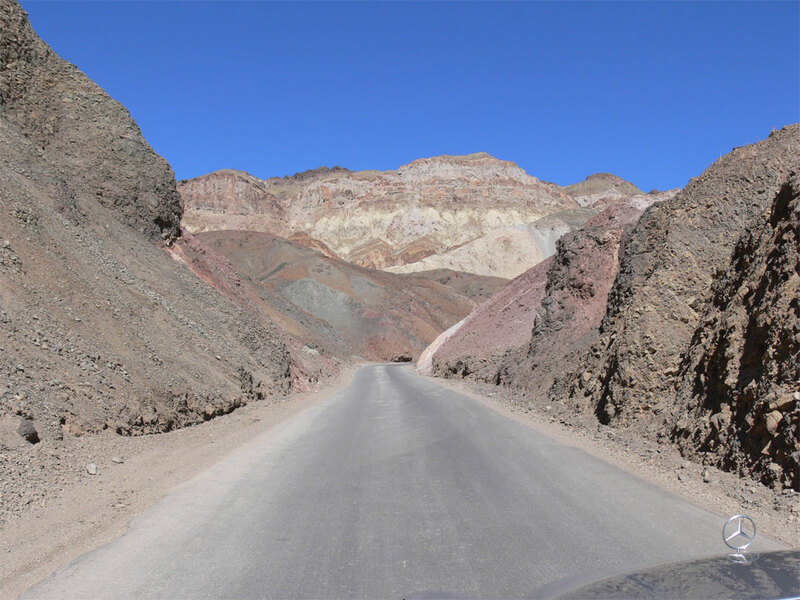 We had reset the GPS to take this over as little previously traveled road as we could. 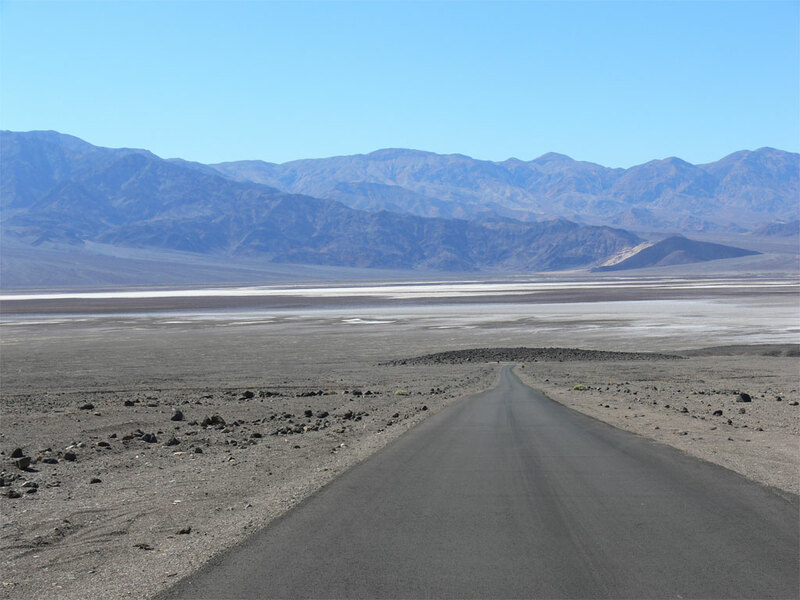 Our route took us south through the rest of Death Valley park, and then back to highway 160. We had lunch again at another casino and then carried on towards Hoover dam. 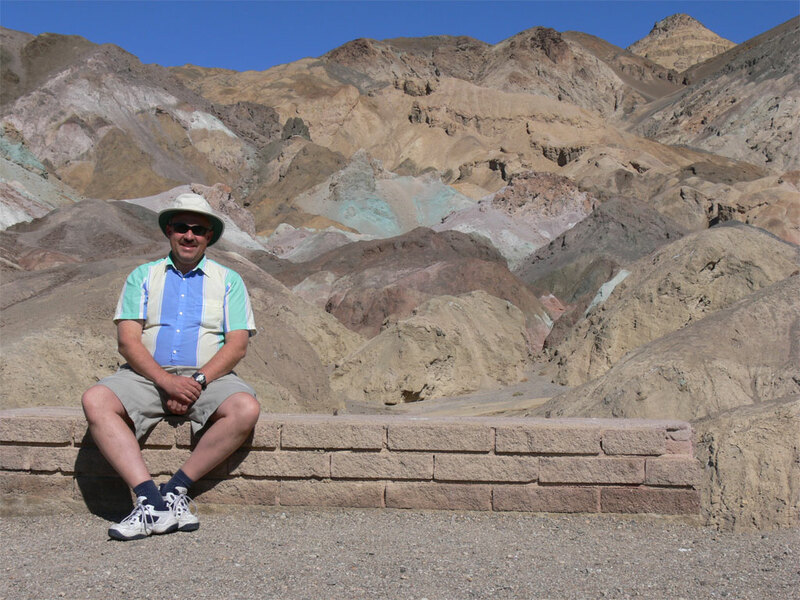 As we traveled, I was able to call ahead on my cell phone using the phone numbers from Microsoft Streets and Trips, and booked a hotel in Boulder City. We arrived around 8:00. We had traveled 466 kilometres today.